As a filmmaker who, like many others of his generation, rented rather than sold work through the London Filmmakers’ Co-operative, Malcolm Le Grice’s first solo exhibition in a commercial gallery raises questions about the display, distribution and, finally, perhaps, displacement of such work. While the exhibition’s playful title – ‘No Idea’ – might inadvertently reflect Richard Saltoun’s frustrating reticence when I tried to engage him on such issues, Le Grice explained to me that he’d intended to emphasize the conditional link between his intuitive approach to filmmaking and his considerable scholarly output as a film historian and theorist. If anything, his works, he once said, present ‘problematics’. From the earliest pieces on display here – for example the seminal mixed-media installation, Castle (1964/2015) or the 9.5mm home movie fragments, scored by Brian Eno, of Little Dog For Roger (1967) – to the latest, Where, When (2015), a 3D multi-screen video collage, Le Grice’s process-based experimentation has consistently been rigorously analytic. ‘No Idea’ also arose, he told me, as a reaction against bon mot conceptualism, where the reach of meaning hangs for a one-line gag. I wonder whether he had in mind, as I did, Martin Creed’s Work No. 227 (2000) – the Turner Prize-winning piece in which a hanging light bulb goes on and off every five seconds in a room. You needn’t have read Nicky Hamlyn’s Film Art Phenomena (2003) to understand Creed’s debt to Le Grice’s Castle (1964/2015) and Castle 1 (1966), found footage of imperial technologies of expansion whited-out by a flashing bulb in front of the screen. At Saltoun, Castle was prominently, sensationally, coaxingly installed in the gallery window. A flashing bulb dangled from a hooked Rauschenbergian appendage fixed above a square painting, its papier-mâché layered surface painted pitch black. To its left hangs the painting’s negative, a similarly layered void, this time painted white. 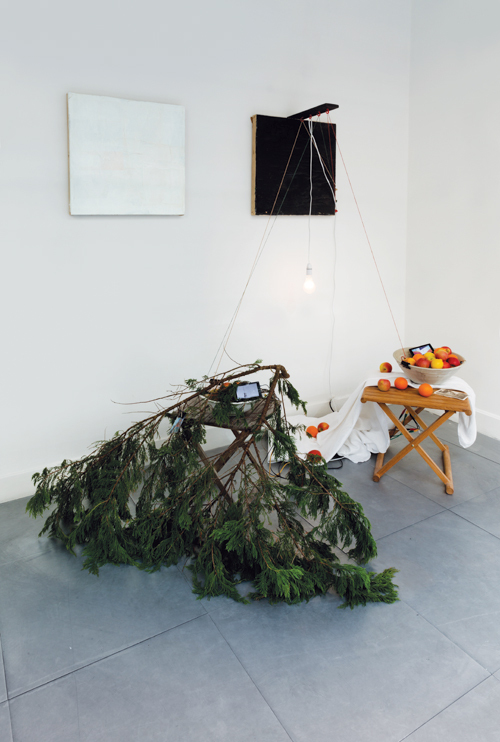 Binary poles of on/off, like the bulb’s flash, the black and white diptych presides over a still-life arrangement of doubled-up objects: string from the black painting’s protrusion is bound to two fruit bowls filled with spherical fruit and miniature LCD screens placed on two found wooden tables. Fruit, mixed with formally homonymic objects, such as tennis balls and lightbulbs, spills from each bowl (the sweet must of slow decay an olfactory register of temporality). One screen displays a real-time feed of the dangling bulb from the fruit bowl’s perspective, a hidden camera gaze that, following the string, schematizes a visible and invisible closed loop; the other displays Castle 1 (1966), proposing a looping yet open sense of time. As Ad Reinhardt, say, in the late ‘60s played end-games with his ‘last paintings’, Le Grice was beginning to move freely between, often combining, paint and printed matter, film, computer art, video and digital media which, parsed in ‘No Idea’, express a radical desire to move beyond specific media in a cybernetic age. (Le Grice had membership number 008 of the Computer Art Society, which also included Gustav Metzger and its co-founder John Lansdown.) Le Grice’s canvases are no anxious icons of ‘last painting’, but an anticipation what we might now call ‘post-digital’ (throughly post-deium) painting. Le Grice’s experiment with media is perhaps another reason he’s fallen between institutional remits. While Tate controversially purchased Creed’s Work No. 227 (2000) for the nation, there’s not a single piece of Le Grice’s in their collection. Arguably, the ‘expanded cinema’ work of Le Grice’s and others of his generation opened the way for younger British artists working in performance and video to exhibit and be collected by institutions. To build a commercial business on exhibiting, ‘rediscovering’ and representing the estates of artists whose careers typically have been antagonistic to the commodity form or marginalized by mainstream institutions is admirable, but there are certain perils. While the rental structure of the Co-op is a reason why Le Grice’s work is not in collections (why edition films, followed the logic, when it is infinitely reproducible – the perfect democratic medium), as soon as the work enters commercial galleries the ‘we’ of the co-op is subordinated to the ‘I’ of private property, the infinitely reproducible to the finite. (Jo Spence is one of Saltoun’s ‘stars’: I’ll never forget seeing her laminated collages in the gallery; at the bottom right was a postal address to write to if you wanted to exhibit them in your local community centre or women’s group.) As the slow creep of institutions and the PhD industry catches up with Saltoun’s period of specialism, artists die and the near-past becomes historical, so speculation looks deft. The museum, which of course still supports market value but never purchases on the basis of financial speculation, is a more urgent setting for the work, ensuring access, scholarship and guardianship. Institutions need to wise up.